Islamist militant group Boko Haram was paid more than $3m (£2m) before releasing a French family of seven, a Nigerian government report says. The confidential report, seen by Reuters news agency, does not say who paid the money. Both France and Cameroon deny paying a ransom while Nigeria has not commented on the issue. 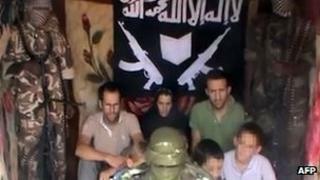 The French family, including four children, were captured in Cameroon in February and freed last week. The were handed over to the Cameroon authorities last Thursday. The Nigerian report also says that Cameroon freed some Boko Haram detainees as part of the deal, according to Reuters. If confirmed, transfer of such a significant amount of money given to Boko Haram could serve to strengthen the firepower of the group, the BBC's Will Ross in Lagos reports. Over the past week, violence in northern Nigeria has escalated as suspected members of Boko Haram have targeted the army and police. Reports say more than 200 civilians have died in the violence. While the army is unable to prevent such attacks, Nigerian President Goodluck Jonathan has appointed a committee to prepare the ground for offering an amnesty to the militants, our correspondent says. The French family, who live in Yaounde, where Tanguy Moulin-Fournier worked for the French gas group Suez, had been returning from a holiday in the Waza National Park in northern Cameroon when they were kidnapped by gunmen on motorbikes on 19 February. Mr Moulin-Fournier, his wife Albane and four children, aged between five and 12, had been joined on their holiday by his brother Cyril. In a YouTube video released about a week after their capture, the militants demanded the release of prisoners in Cameroon and Nigeria. One of them also criticised French President Francois Hollande for sending troops to fight Islamist militants in northern Mali in January. The French-led operation in Mali has ousted the Islamist groups, including al-Qaeda's North African branch, from cities and towns in the vast desert region they had captured a year ago in the wake of a coup. Boko Haram, which began its insurgency following a deadly crackdown on its members in 2009, had previously said it was not involved in hostage taking. It has usually followed a Nigerian agenda, and says it wants to establish an Islamic state. During its insurgency at least 2,000 people have been killed in northern and parts of central Nigeria.